EIGHT HUNDRED towboat operators on B.C.’s coast ended their strike on April 24 after accepting a proposal from a federal mediator. A federal mediator with the federal mediation and conciliation service was appointed to assist in negotiations. The coastal marine service falls under federal jurisdiction. These towboat workers, whose collective is called the Canadian Merchant Service Guild, went on strike April 16 after their previous contract with 16 marine service companies represented by the Council of Marine Carriers expired September last year. They have been bargaining for a new contract since June. The towboat workers are demanding their wages and working conditions be brought up to the Canadian standard in the marine industry. They have expressed firm determination to realize an increase in their claim on the added value they produce from moving goods up and down the coast and manoeuvring ships into and out of port. The 800 members of the Guild last went on strike for six weeks in 1970. As usual when the working class goes on strike, the central crucial role of labour in the production of social product suddenly and almost inexplicably becomes the subject of an excited mass media. At other times, labour is denigrated, rarely mentioned and considered inconsequential in the national economy. Typically the role of capital is exaggerated and made to appear critical to production with the captains of industry and finance made out to be celebrities of grand importance and worthy of lavish lifestyles and unlimited dictatorial power to make economic decisions with impunity. Under the ideology of rewarding the owners of capital with riches and all-power over the economy, a parallel luxury economy has been created that drains resources away from the people’s economy; enormous funds are taken out of the economy in the name of security and fighting enemies abroad; and, the public treasury is plundered to pay the rich. When the inevitable downturn occurs in the capitalist economy, the working class is blamed. Pressure is constantly applied to the working class to reduce its claim on the social product it produces even though labour and natural resources are the two essential factors in social production. The working class faces the grand dilemma: wage a united class struggle or face poverty or even extinction. Workers organized in their collectives must fight for every penny of social product that it can wring from the owners of capital, if they are to attain or maintain a Canadian standard of living. The present dispute affects about 80 per cent of ship docking, marine shipping and tug and barge services along the B.C. coast. Estimates in the mass media put the daily loss of revenue from shipping at tens of millions of dollars daily. According to an estimate issued by the Vancouver Port Authority, “the strike is estimated to have cost the Canadian economy $99 million in lost economic impacts.” B.C.’s coastal forest industry is largely dependent on the water carriers to move logs to sawmills and lumber from those mills to customers. Coastal pulp mills also count on fuel and equipment to arrive by water on barges pulled by towboats, which are normally a common sight plying the straits, bays and harbours of coastal B.C. The Port of Vancouver and FraserPort have been severely affected. Westshore Terminals, which operates a huge coal export facility handling mainly metallurgical coal destined for Japanese steel production (B.C.’s single largest export commodity, bigger even than forest products), and DeltaPort near the U.S. border were virtually halted, with no ships coming in, and shipments of container cargo being turned away. Barges usually piled high with gravel and aggregate from pits up the coast destined for the production of concrete at plants in Vancouver and along the Lower Fraser River were also lying empty. The shipping monopolies, such as Canada Steamship Lines owned by Prime Minister Martin’s family, and the construction, cement and retail monopolies that use the services of the tug and tow boats, routinely exercise their monopoly power to seize more than their due of the value added by the towboat operators. The monopolies do this by manipulating in their favour the price they pay for tug and tow boat services. The government must force the monopolies to pay the full price of production of having their ships put safely into port and commodities transported by barges and towboats. All blame for the strike should be put squarely on the owners of capital, in particular the monopolies who dominate B.C. coastal shipping, who refuse to recognize that the claims of workers to a Canadian standard living is just and necessary. HALIFAX (9 April 2004) – PROMINENT anti-war activists in Halifax have denounced the barbarous U.S. slaughter of Iraqis, defended the right of the people of Iraq for self-determination and called for an emergency rally in that city to end the brutal occupation of Iraq. “With Saddam Hussein gone and no Weapons of Mass Destruction found, what do the occupation forces want now?!! “1. Annihilation of anyone who opposes occupation. wish to ‘legitimize’ what cannot be legitimized; to ‘justify’ what cannot be justified. “The Occupation is illegal and criminal! “Resistance is legitimate, necessary and inevitable. The call was unanimously adopted after an emergency session of the weekly Halifax Political Forum on 8 April 2004, following the viewing and discussion of the film In Search of Palestine at Dalhousie University held on the anniversary of the massacre in Deir Yassin (9 April 1948). As well a special political forum on “On Current Developments in Iraq” will be convened on Wednesday, 14 April, at 7 pm in the Dalhousie Student Union Building. In introducing the draft statement, Tony Seed said that the current upsurge of the Iraqi people in which hundreds of people have been killed and thousand wounded demolishes all the attempts of the U.S. and the allied governments to present occupation as “democracy” and “liberation”. What we have is a Eurocentric neo-colonial state solution which will guarantee the positions of the Anglo-American and other multinationals and interests. Referring to previous media reports emphasizing alleged Shia-Sunni clashes, he said the modus operandi of U.S. rule involves the use of invented pretexts, staged events, fake encounters and disinformation to incite sectarian civil war and justify armed repression, as well as to turn the people of the West against the anti-imperialist struggles of the peoples of the Middle East. The unified actions of the Iraqi people regardless of their faith backgrounds, who have never participated in civil war, is an act of national resistance. It is they who have the right to decide their destiny. In the same fashion we are also seeing “terrorist” events in Canada that are highly suspect to justify repression in the name of quelling “hate crimes.” This necessitates the establishment of an anti-war government in Canada. Dr Ismail Zayid said that the brutal massacres perpetrated, by an illegal occupation, against men, women and children, with demolition of homes, attacks on religious sites, torture and daily humiliation, are all in violation of the Fourth Geneva Convention, and thus war crimes, as defined by international law. The message was being widely circulated on Friday, April 9 on e-mail lists. RALLY: END THE OCCUPATION OF IRAQ! There will be an open mike. Sponsored and endorsed by, among others, Canada Palestine Association and the Halifax People’s Front. This 50-minute documentary, by a U.S. film-maker/member of Americans for a Just Peace in the Middle East, goes beyond the demonizing images we usually see and hear in the media in order to expose fully what a horrific crime the Israeli Occupation actually represents. Featured are: B’Tselem (Israeli Information Centre for Human Rights), Prof. Jeff Halper (Director, Israeli Committee against House Demolitions), Allegro Pacheco (Israeli-Jewish attorney representing Palestinians in Israeli Military Courts and before the Israeli High Court). 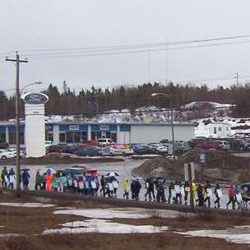 Approximately 300 NAPE and CUPE members marched through Grand Falls-Windsor on April 6, 2004.